Almost a decade ago, the first place deck after the Swiss rounds at Pro Tour Chicago was Counterslivers. Eight years later, Slivers won Pro Tour San Diego. This year’s Resident Genius award winner took Slivers to the top eight of GP Montreal. Right now, Slivers is a top Time Spiral Block Constructed deck. Years and years ago, Tempest block introduced Slivers. At that time, slivers featured in some very powerful Extended block decks. Here’s a typical version and an analysis, which I wrote over on StarCity Games. Counterslivers made it to the semi-finals of the “Ultimate Extended Tourney,” which pitted 32 of the best Extended decks of all time. You can find all seven of the UET articles in my StarCity archives. That deck is from three-quarters of a decade ago. Is it still relevant? Frankly, no – and certainly not to online play. Not yet, at least. Someday, Exodus and Alliances may be released online, and we may once again see players Consulting for Force of Will, and casting Crystalline Sliver for the win. But not any time soon. Without the card drawing, insane tutors and Force of Will, Counterslivers is no longer playable, even in paper. No, you didn’t miss anything. The Legions slivers were totally unplayable, even in limited. This is a card advantage machine. In constructed matches, I have played this card on trun four, and by turn ten I have drawn half my deck. Drawing cards wins games – and nothing in Time Spiral block can outdraw a Slivers deck. Not even Aeon Chronicler. This is the second key sliver. It does let you sacrifice the Dormant Sliver before combat, while having a chance to get it back afterwards. More importantly, it also gives you a shot at surviving a board clearing Damnation or Sulfurous Blast – pretty much anything but Molten Disaster with split second. would let you use Dormant Slivers to tap everything down. Might Sliver would pump everything, then you could get rid of the Dormant Slivers and beat for the win. A second combo involved Might Sliver and Psionic Sliver. Psionic Sliver would allow any sliver to ping the opponent for two damage. Might Sliver would ensure that it survived when doing so. The result was often pinging an opponent for ten damage on his end step, then another ten during your upkeep. These sliver decks were good, but not exceptional. They were vulnerable to disruption. The first really good sliver deck combined the power and card drawing of slivers with the disruption and potency of Wild Pair. Here’s the build that made Top 8 at Grand Prix Montreal. Wafo-Tapa’s build was not really a pure slivers deck. It used the slivers as an alternative win condition, but mainly as a method of holding the board and drawing into the cards and mana to set up the Wild Pair engine. At that point, casting and bouncing a Whitemane Lion allows Wafo-Tapa to tutor for, and put into play, a ton of potent cards. Wafo-Tapa’s deck is good, but not awe-inspiring. Once opponents understand what is happening, it is not all that hard to disrupt and beat the deck. Wafo-Tapa took it to the Top 8 because 1) it was unexpected, and 2) he is one of the best players in the world. Wild Slivers appeared online, on occasion, and even made the Top 8 of some Premier events. It was solid, but not a world beater. Pro Tour San Diego was a limited, two-headed giant event – but it proved to the world just how good Slivers could be. The games were FAST! In the first match, the shuffling and cutting took longer than the play. Play consisted of a turn one Virulent Sliver, turn two Virulent Sliver, turn three Shadow Sliver, turn four kill! It was completely insane, and the lightning fast finals proved that Slivers beatdown was no fluke. In the finals, Poison counters did nothing, but slivers hit for about 20 damage on turn six or so – past blockers thanks to a Two-Headed Sliver. 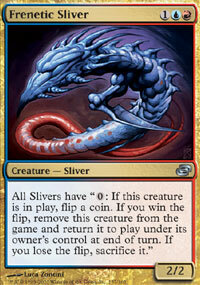 After PT San Diego, the sliver folks started reworking Slivers. The deck metamorphed from a combo enabler and aggro-control deck to a monster. 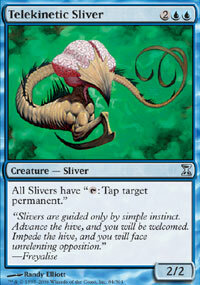 The deck replaced the slow and expensive Wild Pair with the much faster sliver tutor Homing Sliver. It also cut mana off almost everything – replacing the four mana Reflex Sliver with the three mana Firewake Sliver, and adding a couple one mana slivers. Here’s the deck, as it now commonly appears online. The deck has three main paths to victory. First of all, it can Poison the opponent. 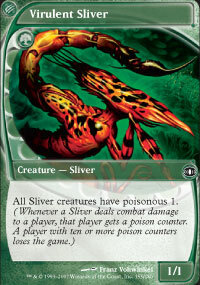 With two Virulent Sliver in play, all slivers have two Poisonous 1 abilities – meaning that every single sliver that connects deals two poison counters. Since ten poison counters is game, that adds up fast. I have killed on turn four fairly often – sometimes by Summoner’s Pacting for an extra Virulent Sliver. Two-Headed Slivers can prevent your slivers from being blocked to any significant extent. The second path to victory is to just beat down. Remember that your Fiewake Slivers can convert any blocked slivers into two damage if any other sliver is unblocked. The sliver beats are not all that fast, but even a bunch of 2/2 and 1/1s hitting home can add up. The third option is to mill the opponent. 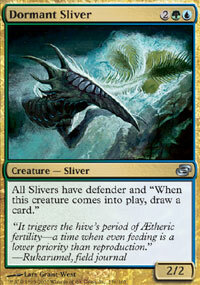 Shrieking Slivers are mainly present because they are cheap, but they do let livers tap to mill the opponent. Five slivers, plus the opponent’s draw phase, will deck an opponent in eight turns or so. It’s not recommended, but if the opponent plays something like Magus of the Moat, that may be all you can do. This deck is not a pure beatdown deck. Sure, you take the turn four win if t is there, but the odds are also quite good that you can win the long game as well. Oncce Slivers gets a Dormant Sliver or two in play, it can outdraw anything. I’m not going to go into huge details here. The best way to learn the deck is to practice, and the best part about this deck is that it is cheap. The only expensive rares are the lands, and I cheat there. I only own three copies of Burnwillows, and three Gemstone Mines. (I just blew my budget on Tarmogoyfs and Coalition Relics.) I substituted in basics. Sure, I get mana screwed a bit, but it still works quite well. It works well enough, at least, that I have won most of my matches in the Tournament Practice room. If you take it into the 8-mans, get the lands first. The cost of the Mines is less than the entry fee you could forfeit to mana screw. Grove of the Burnwillows is just a bit more – but you will be playing them for a long time. Your best friend in this matchup is Firewake Sliver, followed by Frenetic Sliver. Firewake, with an untapped mana, fizzles their Tendrils of Corruption and everything but Sudden Death and Take Possession. Frenetic Sliver gives you a fighting chance against Damnation. Beyond that, you are often faster than they are. Poison counters add up fast. Harmonic Sliver can be fun. It, plus a couple extra slivers, can smash a lot of Coalition Relics and Prismatic Lenses. It can also clear away an annoying Take Possession. After sideboarding, you can bring in Boom // Bust and try to get some slivers in play, including a Gemhide, then blowing up all the lands. It doesn’t always come off, but when it does, you are golden. This was the hot deck at the PTQs, but it is a cakewalk for slivers. It has fast beats – right up to the point where you slivercycle for Telekinetic Sliver and start tapping all their big scary monsters. I was playtesting this matchup (in paper) for a couple hours last week, and I think GW Tarmogoyf won one whole game. After sideboarding, they may have Serrated Arrows and maybe Sunlances, but you have Harmonic Sliver for the Arrows, and Frenetic Sliver to dodge the Sunlances – not to mention three more telekinetic Slivers. Poison slivers was the reason I gave up on GW Tarmogoyf for the PTQ season. That said, I keep thinking that Crovax, Ascendant Hero might be the answer that GW Goyf needs. I haven’t seen it played yet, but the theory sounds good. I don’t know how slivers could deal with that. The mirror is just bizarre. You need to play around the opponent – but they have all the same abilities you have. I becomes a chess game, but one where half the pieces are hidden in your opponent’s hand. It comes down to strange tricks, like Freneticing out your own Dormant Slivers during your opponent’s upkeep, so they don’t draw cards off them, while they may return for your enjoyment next turn. You bring in Dead // Gone, to kill your opponent’s slivers. I have even thought about strange inclusions, like (Bogradan Hellkite). It is expensive, but with some slivers, including a Gemhide, it is not that hard to hit the mana, and Bogardan Hellkite can massacre an opponent’s slivers. Still, Serrated Arrows may be the best answer. I really don’t know. It’s like GW Tarmogoyf, but with worse creatures. Telekinetic wins this matchup going away, unless they have Calciderm. Calciderm requires chump blocking. The classic mono-red beatdown decks are not bad. (Mogg War Marshall) can block, even when Two-Headed Slivers is in play, but the beatdown decks have ust as much trouble with Telekinetic Sliver as anything else – and in the long run you will outdraw them by a ton of cards. The scary decks, however, are the big mana red decks, that maindeck things like Rough // Tumble and Molten Disaster. These also tend to pack Greater Gargadon and Word of Seizing, with can eat your slivers whole, plus plenty of Dead // Gones. This matchup is a bear. I built my version of Big red specifically to smash slivers decks – and now I am seeing other versions appearing on MTGO. Pickles is the mono-blue or base blue deck built areoun Vesuvan Shapeshifter and Brine Elemental. You need to race them – if they get the lock going, you have almost no chance. On the plus side, you are a lot faster. Bring in Dead // Gones for the morphs. Sometimes you can kill them, sometimes they turn into Fathom Seers. You could also try Boom // Bust, but I have not had a lot of luck with that. In conclusion, I’m afraid I’m a week late with this article. A week or two ago the slivers deck was a surprise, and it ate a lot of people’s lunch. Today, a lot more decks are ready for it. Even so, this deck is a lot of fun – a lot more than anything else you can get for a comparable price. Even if you replace the Burnwillows with 2 forests and 2 mountains – a change which will save you almost 30 TIX, or half the cost of the deck – you still will have a competitive deck that can blows a lot of more expensive decks clear out of the water. plague sliver +poison = you get poisoned online. also in some cases poison still effects if the damage has been provented. these are known issues. but people should be aware of them. Nice article! You are correct, it is a week late or so. I've seen a bunch of people starting to Sideboard Plague Sliver and Hail Storm to deal with the awesome power of the slivers! I've been playing this deck for a week or so and have discovered on MOL there is a bug that when you use Psionic Slivers ability on your opponent it will give your opponent poison counters if you have virulent slivers in play.